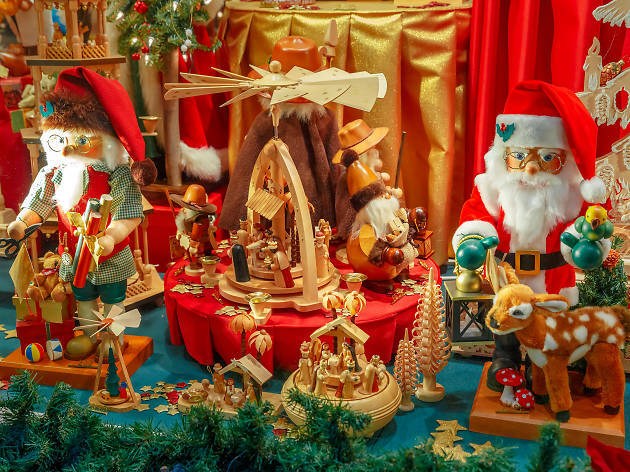 Holiday shopping at department stores can be a nightmare, but the Christmas window displays NYC offers make combatting the tourist-packed realm that is Fifth Avenue worth it. Those ornate holiday windows decked out with hundreds of Christmas lights and more winter wonderland decor are so impressive, they might be reason enough to stroll through midtown. Our advice? Wait until the out-of-towners have gone to bed so you can view the decor free of crowds. 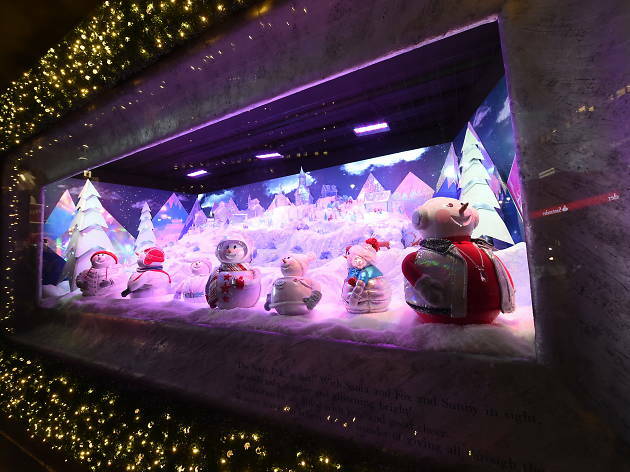 For all the information you need to know about this year’s Christmas windows including their unveiling dates (all of which occur in November), read on below. And if you want to remain in the holiday spirit, we have recommendations on where to go ice skating in NYC, and then Christmas-themed bars (like Rolf's) where you can go to warm up afterward. To usher in the holiday season, the luxury retailer was inspired by Dr. Seuss' The Grinch, or at least Illumination's and Universal Pictures’ newest version. 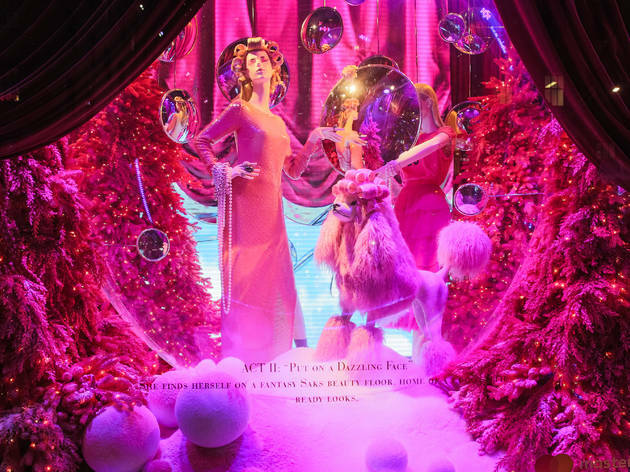 In addition to telling a beloved story about a holiday hater turned merry maker (along with some mannequins serving fierce, whimsical holiday looks), the windows offer some high-tech interactive features. That's right, they're more than just something pretty to look at! The first window allows passerby to take a selfie which then appears inside the window next to the Grinch's head. A few windows down, music lovers can press buttons with the Grinch's trusted canine companion Max. These knobs play sounds coming from the Grinch's snazzy organ. In the same window, there's also a telescope popping out of the glass which viewers can look through to see what's up in Whoville. 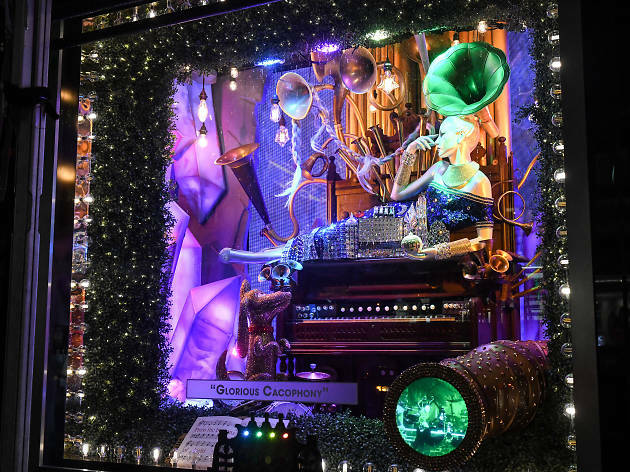 This year, Saks Fifth Avenue’s holiday window display reminds you to "treat yo'self." The department store partnered with Broadway Cares/Equity Fights Aids to transform six of its Fifth Avenue-facing windows into scenes that represent the brand's most luxurious offerings. The installation is called "Theater of Dreams," and is an ode to the "grandeur of the Broadway stage." When you go, you'll see incredibly detailed vignettes modeling the latest holiday looks while posing outside of an elite Fifth Avenue club. There's also an Emerald City-esque shoe emporium, a pretty-in-pink beautifying station and more. The brand’s 2017 windows titled “The Best and the Brightest,” spotlighted unique scenes through the lens of a snow globe. Sadly, that was the retailer's last extravagant display. After 104 years in business, Lord & Taylor is closing and will transform into a WeWork space in 2019. For its last hurrah, its five windows are decorated to celebrate Lord & Taylor's legacy and act as a thank you to New York City. 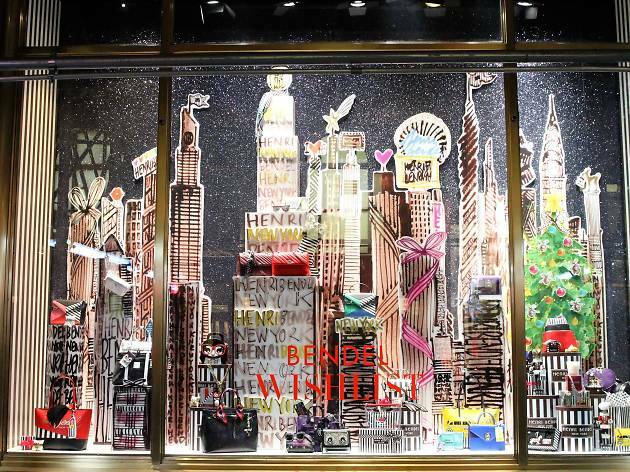 Henri Bendel debuted an artistic display in collaboration with fashion illustrator Izak Zenou. This year's display offers more of a traditional Christmas theme. Ogle some of Bendel's classic wrapped presents which are centered around a 20-foot tree out of every "Bendel girl's dreams." This Tiffany-blue display will certainly dazzle any passerby on Fifth Avenue. The brand's display tells a story about the main protagonist (Tiffany's, of course) in a delightful and charming way. This year's theme is "Believe in Dreams," which takes onlookers behind the scenes of a whimsical Tiffany workshop. 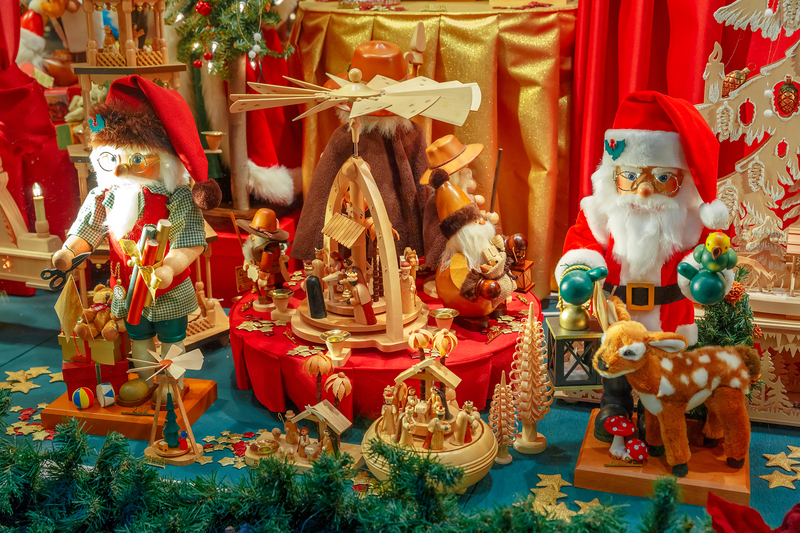 Macy’s in Herald Square showed off its legendary display titled "Believe In The Wonder Of Giving” which inspires onlookers to get into the holiday spirit. The six displays showcase a new Macy's figure: Sunny the Snowpal. Award-winning designer and Macy's National Director of Windows Presentation, Roya Sullivan, is the creator of the 2018 iteration. The scenes show Sunny in various settings and include a custom interactive video game that lets guests zoom the snow buddy through snowflakes as he tries to catch up with Santa's sleigh. 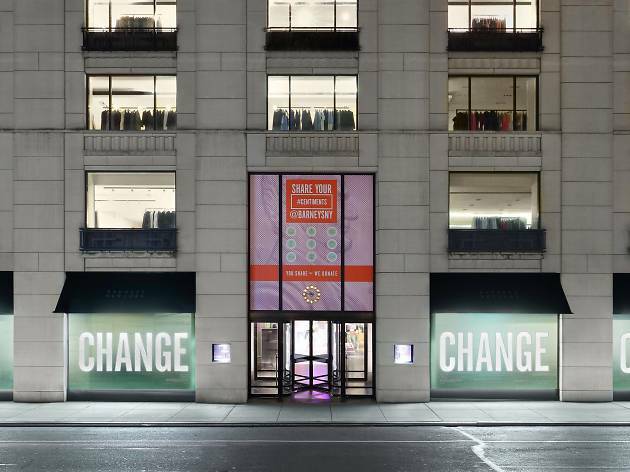 The luxury retailer’s theme this year is “Make Change,” and you won’t find Santa, reindeer or snowflakes in any of these five windows. Instead, you’ll find that the store is taking a more philanthropic approach to highlight its partnership with Save the Children—a nonprofit that helps fun early childhood education programs. As an ode to the message that even small change can have a big impact, Barneys' famed window displays and interactive in-store experiences are inspired by and made with real coins. 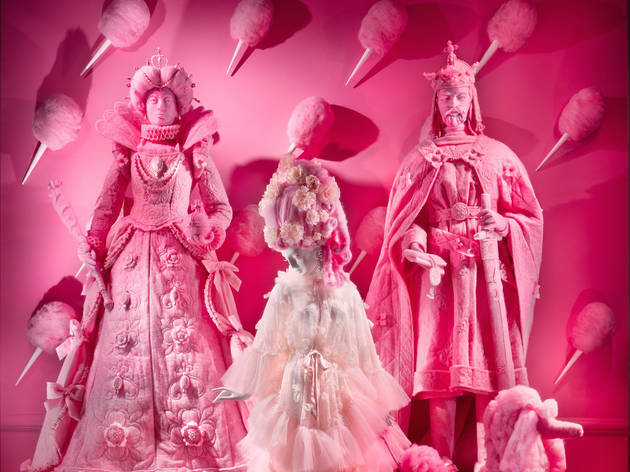 Bergdorf Goodman’s sweet display is a "visual feast" featuring mouthwatering treats galore. As David Hoey (Senior Director of Visual Presentation) says, "Our artistic team became faux-pastry chefs, dishing up a wall-to-wall profusion of sculpted confections." The mannequins are sporting candied and lavish designs that truly make the displays a dreamlike, Willy Wonka-inspired wonderland. Get your holiday decorations in one spot! Looking for a Christmas store? NYC has just the place to bring you holiday cheer and ornaments for your tree.